Jacquie Greco celebrates a goal against the New York Riveters. Photo by Troy Parla. 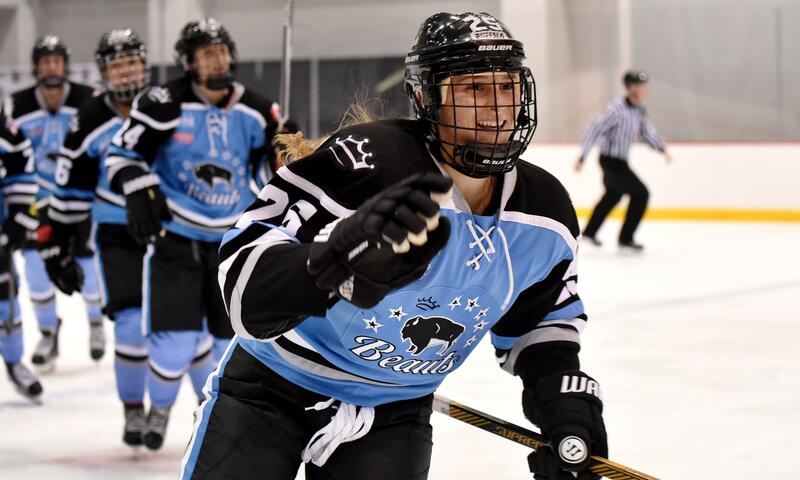 BROOKLYN, NY – The Buffalo Beauts are getting another one of their top leaders back. Defender-forward Jacquie Greco, a versatile player on the 2017 Isobel Cup championship team, has re-signed for next season. While playing for the Beauts, Greco is a marketing manager for Pegula Sports and Entertainment, which owns the Buffalo Sabres and Buffalo Bills. The Buffalo-raised Greco played 15 regular season games in 2016-17 for the Beauts, and in the club’s playoff victory over New York and the Cup-winning stunner over Boston. Greco studied Communications at Syracuse University while playing 124 games over four seasons from 2009-2013. 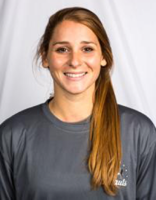 The 5-7 defender-forward was alternate captain of the hockey team in her junior season and a tri-captain as a senior. She later earned her master’s in Television, Radio and Film from Syracuse. Greco played youth hockey in the Buffalo Bisons program and also played lacrosse and field hockey in high school. Buffalo Sabres forward Justin Bailey is a cousin of Greco’s.